The first time you visit Washington DC, or any new destination, the question asked isn’t usually what attractions should be scene but what attraction to see first, what to expect, how to get there, and how much time is needed. We’ve provided tips, advice, and other information about the top tourist attractions in Washington DC to help with your itinerary planning. The White House has been the official residence and office of every U.S. president since John Adams. The only president never to live in the White House was George Washington. However, Washington had a hand in choosing the location of the White House (originally called the President’s House) and selected its builder, James Hoban. Construction on the White House began in 1792 and was completed in 1800. During the War of 1812, British soldiers set fire to the White House. Much of the interior was destroyed. Fortunately, Dolley Madison was able to save the portrait of George Washington, painted by Gilbert Stuart (the painting is still on display today). The structure of the White House remained intact. Furthermore, care was taken to preserve as much of the original architecture as possible. The charred exterior was covered up with a gleaming white paint. From that point on the “President’s House” was know as the White House. Over the last century, many presidents have left their stamp on the White House. However, few decorations or furnishings prior to 1902 remain. In 1961, Jacqueline Kennedy created the Committee of Fine Arts, which works to ensure the preservation and upkeep of the White House. Due to post 9/11 security measures, touring the White House was temporarily suspended. However, today the White House is once again open for public tours. Highlights of the White House tour include visiting the Gold-and-White Room, the State Dining Room and the Green Room. Tour guides provide insightful information and are quick to point out interesting facts about the White House and its decor. Touring the White House is an interesting, entertaining and educational experience for all. Address E. Capitol St. and 1st St. Hours 9:00 am – 4:30 pm Mon.-Sat. The U.S. Capital Building is a masterpiece within itself. However, you’ll also find majestic paintings, sculptors, and other fine works of art that depict various periods in American history distributed throughout the building’s interior. The gem of the Capital Building is the Rotunda – a 96-foot wide circular hall with a 180-foot high dome like ceiling. The dome, which was completed during the Civil War, is a familiar sight from outside the Capital Building. The dome’s interior was painted by Constantino Brumidi. The most famous component of the mural is "The Apotheosis of George Washington", which consist of a portrait of George Washington surrounded by Roman gods. The gods are said to be watching over the progress of the nation. Brumidi is considered the Michelangelo of the Capital for his marvelous contributions to its splendor. The Rotunda is located near the entrance of the Capital Building as is usually the first stop on the tour. Other stops include the Old Supreme Court Chamber and the National Statuary Hall. The Old Supreme Court Chamber, which is quite a spectacle, has been restored to its 19th century appearance. The National Statuary Hall was originally the Chamber of the House of Representatives. It became the Statuary Hall in 1864. Each U.S. state was asked to contribute two statues each. Today, there are a total of 97 statues. (Nevada, New Mexico and North Dakota only contributed one statue each.) The statues honor individuals of historical significance. Tours of the Capital Building last about 30 minutes. Getting tickets is a bit of a hassle. The ticket office (located on the southwest corner of the Capital grounds) distributes a limited number of free tickets daily. Tickets are first come first serve. Furthermore, every person in your party must be present at the time you receive your tickets. Tickets go fast so it is generally recommended that you get in line outside the ticket office prior to when the doors open at 9:00 am. Tickets are for various time slots throughout the day. Therefore, you’ll have to wait and see what time your tour starts. If you have a large group with you (example: a school field trip) you may arrange for a private tour 1 month in advance by contacting your local congressional office. Tours of the Senate Gallery and the House Gallery are also available. However, you’ll need to request separate passes directly from your Senator or Representative. The Senate Gallery is only open to visitors when it is in session. Children under six are not permitted. Flags are flown from the north wing of the Capital Building when the Senate is in session and from the south wing when the House is in session. If you’re lucky both will be in session during your tour of the Capital Building. In the heart of Washington DC stands the Washington Monument. 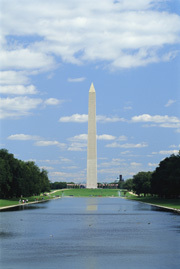 The monument is centered between the Capital Building, the Lincoln Memorial, the White House and the Jefferson Memorial. From atop the Washington Monument you can catch a spectacular view of the capital city. Consequently, there is no better way to get acquainted with the city. Construction on the Washington Monument began on July 4th, 1848. However, the project was brought to a halt during the Civil War and was left uncompleted. Construction started back up again in 1876, after the war. This time around the appropriate financing was set a side to complete the project. Today visitors can see a change in the color of the stones used about half way up the pillar. This signifies the difference in masonry used at the beginning and the end of the project. The Washington Monument was finally completed in 1885 and was opened to the public in 1888. If you want to take the elevator ride to the top of the Washington Monument, you’ll need to pickup tickets at the information booth. Tickets are free but they go fast. You may want to make a reservation in advance. The Washington Monument is a fitting tribute to our nation’s father and, rightfully so, is one of the city’s favorite landmarks. The Vietnam Veterans Memorial (also called the wall) consists of two black granite walls joined at a 125-degree angle. The walls point to the Washington Monument and the Lincoln Memorial. Inscribed on the walls are the names of 60,000 people who lost their lives during the Vietnam War. The Vietnam Veterans Memorial, believed by many to be long over-due, was conceived by Vietnam Veteran Jan Scruggs and erected in 1982. The names are listed in chronological order. However, it’s no small task to locate a specific name on the wall. Even if no one close to you died during the Vietnam Was, it’s heart wrenching to watch others search for the names of their beloved ones. Allow 20-30 minutes to explore the Vietnam Veterans memorial, longer if you’re planning to lookup the names of family members or friends. There is limited parking available along Constitution Avenue. The Lincoln Memorial was dedicated in 1922. Since then, it has grown to become one of Washington DC’s most popular attractions. The neoclassic structure, designed by Henry Bacon, cleverly commemorates Lincoln’s achievements as president. The Lincoln Memorial’s enduring popularity is a testament to the president’s legacy and historical importance. The memorial continues to attract thousands of visitors daily. The Lincoln Memorial’s most important attribute is the famous statue of Lincoln seated, which is centered atop the stairs in the memorial. The Gettysburg Address along with Lincoln’s second Inaugural Address are inscribed on the limestone walls behind the statue. The Lincoln Memorial was the setting for Rev. Martin Luther King’s famous “I have a dream” speech. There is a small museum, a bookstore and an information booth onsite. You’ll need about a half hour to explore the Lincoln Memorial. Afterwards, you may want to spend some time strolling along the walkways surrounding the memorial.